"When the Empress died at the age of 64—still beautiful—her last will and testament was opened, and shocked the entire royal family. Instead of a state funeral and proper internment, the Empress requested that her body be garbed in the simplest cloth, then flung onto the streets. When people saw her delicate flesh rot away, the meat of her body picked at by crows and wild dogs, and her beautiful body reduced to unlovely bones, at last they would understand the impermanence of things and perhaps learn the lesson she had been trying to teach them." The location in Kyoto where Tachibana's body decayed is still known as Katabira no Tsuji (Crossroad of Corpses). 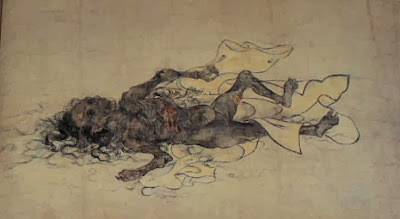 Her posthumous act inspired a genre of Buddhist painting known as Kyuaizu (九相図), which functioned as memento mori, juxtaposing a person's beauty during life with the 9 stages of decay the body passed through after death. Above is the depiction of Stage 7, "Food for Beasts (噉食相)."